We open as the all-female band Misfit Toys power through a song at their latest gig in a less than impressive venue but with the stage seemingly crumbling around the group and the sparse crowd turning against them it all comes to an abrupt end. The aggro spills over from there and as the hecklers becomes an arrest & then an unflattering newspaper appearance, the hopes of more gigs seem to dwindle away in the aftermath. From those apparent depths they find the will to soldier on and with an email request to help another downtrodden soul the empowered band members hit the road with an eye on making a difference in the lives of those that need help. Their will to fight fire with fire ends up with them taking a swipe at a corporate giant doesn’t go unnoticed and as their online fame builds they’re soon putting the band back together for their lawyer turned manager…….and just in time for a twist as the issue closes out. An exceptionally strong cast of characters has been put together by writer Erin Keepers who veers away from a cookie-cutter style band to bring us a realistic set of misfits that fit well together in a story that feels like it has something to say about the wider world it’s part of. Catriona Laird on art gives those characters their own sense of style in a world that’s in-line with our own imperfect society and Gaby Epstein splashes the pages with some beautiful colours and Rob Jones adds his usual expert-level lettering to round-off an impressive group of creators. 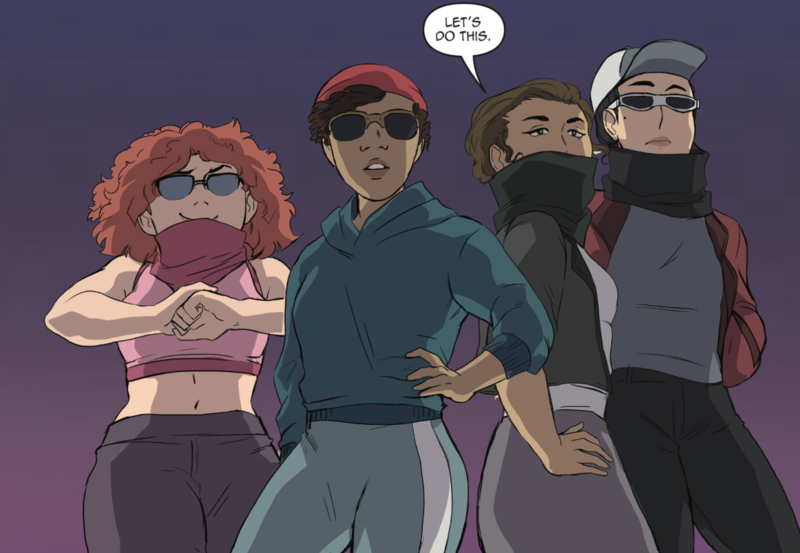 We end up with an all-female creative team (+ Rob) bringing us an all-female band to life and as the superficial world of fame plays tug-of-war with the harsh realities of every-day life, it ends up feeling like a slick way to get a comic filled with some valuable social commentary to the masses. It’s instantly engaging and the absurd world that they find themselves in starts to drip-feed a supporting cast that’s all set to take advantage and target our new favourite group. The extra detail of character design and even song lyrics is a great touch to add for this opening release. Kudos to Cult Empire for adding this one to their line-up and for bringing a team together that raises the bar for music-filled vigilante comics. Roll on volume 2. Keep up to date with the Nasty Girls series over on the titles Facebook page and check out the Cult Empire Comics website, Facebook & Twitter pages for more on this and their other titles. 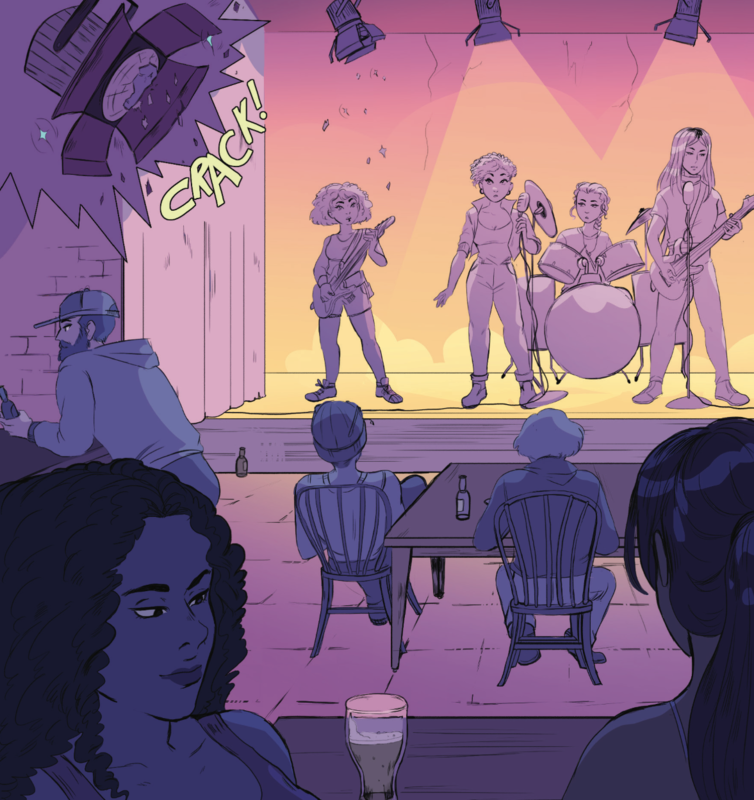 This entry was posted in Comic Reviews, Indie and tagged Catriona Laird, Cult Empire Comics, Erin Keepers, Gaby Epstein, Kickstarter, Nasty Girls, Rob Jones by G-Man. Bookmark the permalink.